It’s the most powerful accelerator-based neutrino experiment ever built in the United States and the longest-distance one in the world. 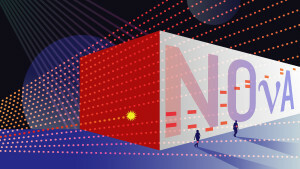 It’s called NOvA, and after nearly five years of construction, scientists are now using the two massive detectors – placed 500 miles apart – to study one of nature’s most elusive subatomic particles. A view across the top of the NOvA far detector in Ash River, Minnesota. Electronics that make up part of the data acquisition system are installed along the top and sides of the detector. The far detector measures roughly 200 feet long, 50 feet high and 50 feet wide, and is made of PVC filled with a scintillating oil. Neutrino interactions inside the detector create light, which travels up fiber optic cables to the banks of computers. Photo: Fermilab. 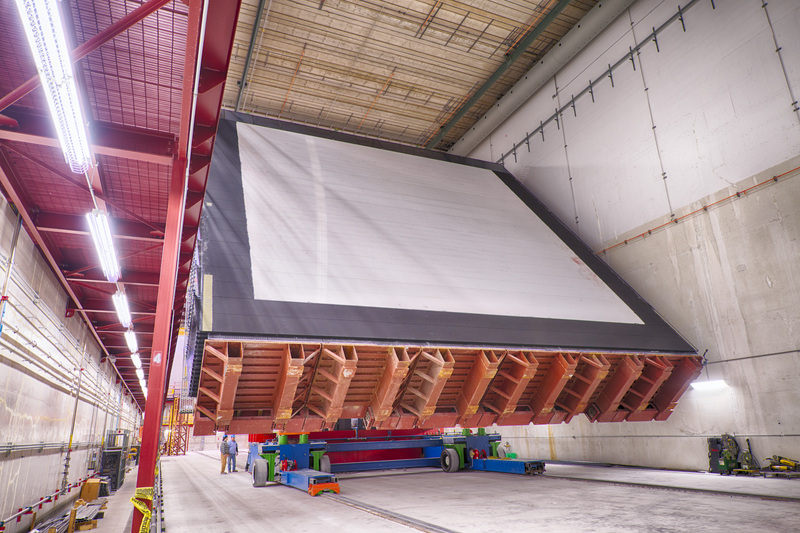 The massive pivoting machine moves one block of the NOvA far detector across the hall in Ash River, Minnesota, to connect it with the rest of the detector. Each block measures 50 feet by 50 feet by 6 feet, and was assembled from PVC modules crafted by University of Minnesota students. Photo: Fermilab. A worker guides a completed module of the NOvA far detector into place, joining it with the rest of the detector. The completed detector, built in Ash River, Minnesota, measures roughly 200 feet by 50 feet by 50 feet. Each new module was constructed on the massive pivoting machine and slowly maneuvered into place. Photo: Fermilab. A man stands near the partially completed NOvA far detector in Ash River, Minnesota. The detector, constructed entirely of PVC, stands 50 feet tall and 50 feet wide. 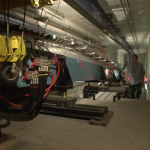 The completed detector is roughly 200 feet long. 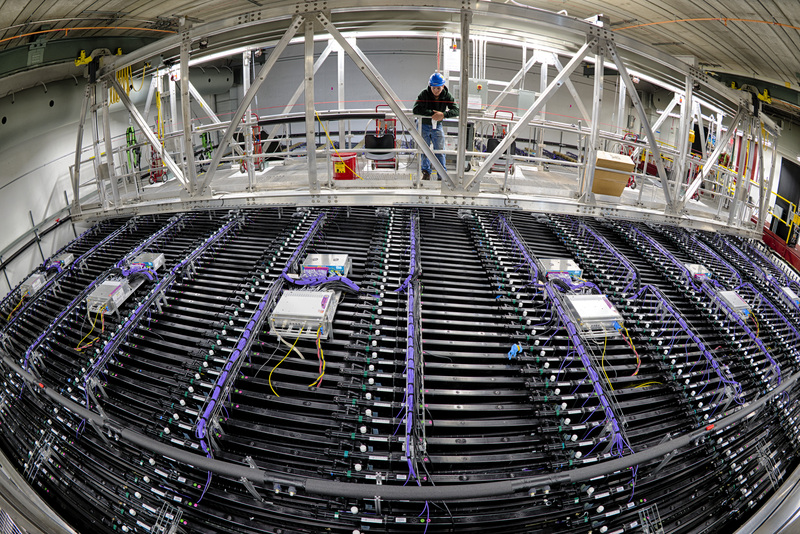 The NOvA team received final DOE approval for the completed detector in September 2014. Photo: Fermilab. The NOvA near detector, built underground at Fermilab in Batavia, Illinois, is roughly 47 feet long, 14 feet high and 10 feet wide. It is constructed of the same material as the far detector. Photo: Fermilab. A graphic representation of one of the first neutrino interactions captured at the NOvA far detector in northern Minnesota. The dotted red line represents the neutrino beam, generated at Fermilab in Illinois and sent through 500 miles of earth to the far detector. 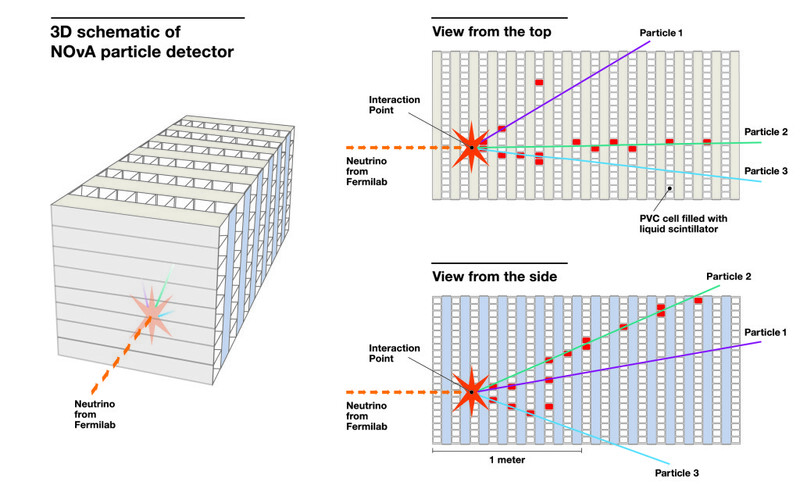 The image on the left is a simplified 3-D view of the detector, the top right view shows the interaction from the top of the detector, and the bottom right view shows the interaction from the side of the detector. 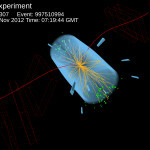 Illustration courtesy of Fermilab. 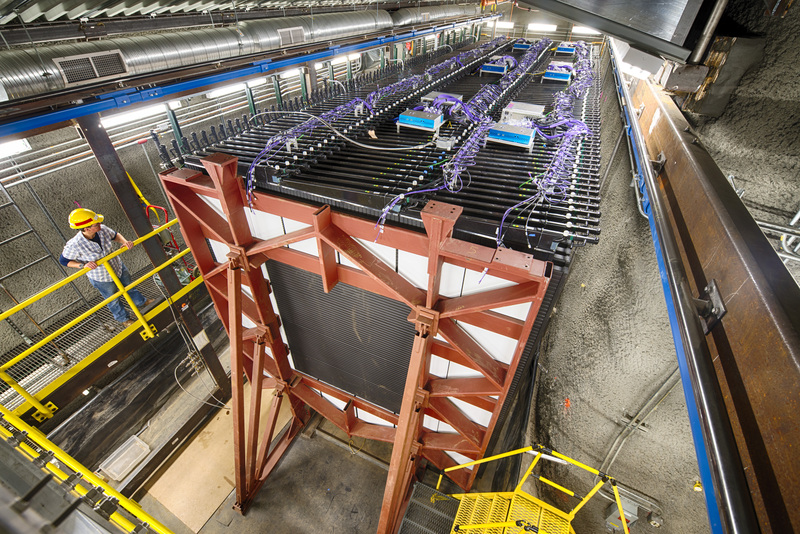 Data collected at the NOvA far detector in northern Minnesota shows one of the first interactions captured at that detector from a beam of man-made neutrinos. 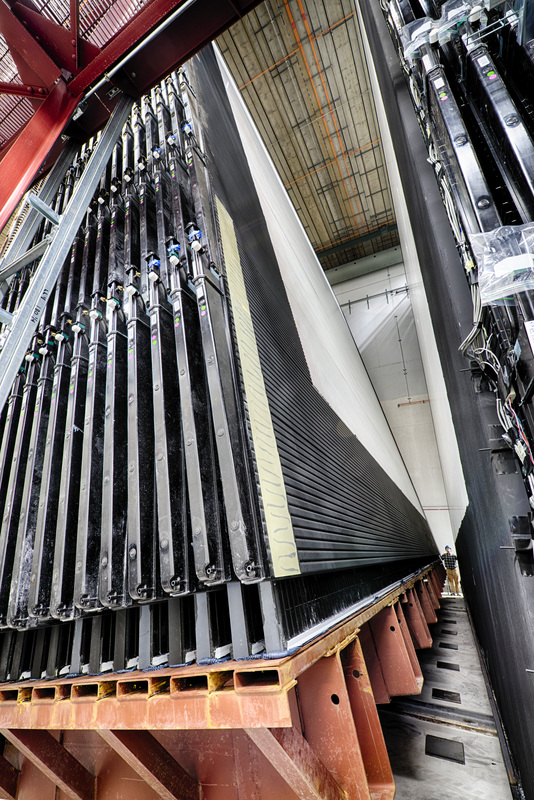 The neutrino beam is generated at Fermilab in Illinois and then sent through 500 miles of earth to the far detector. Image courtesy of NOvA collaboration. 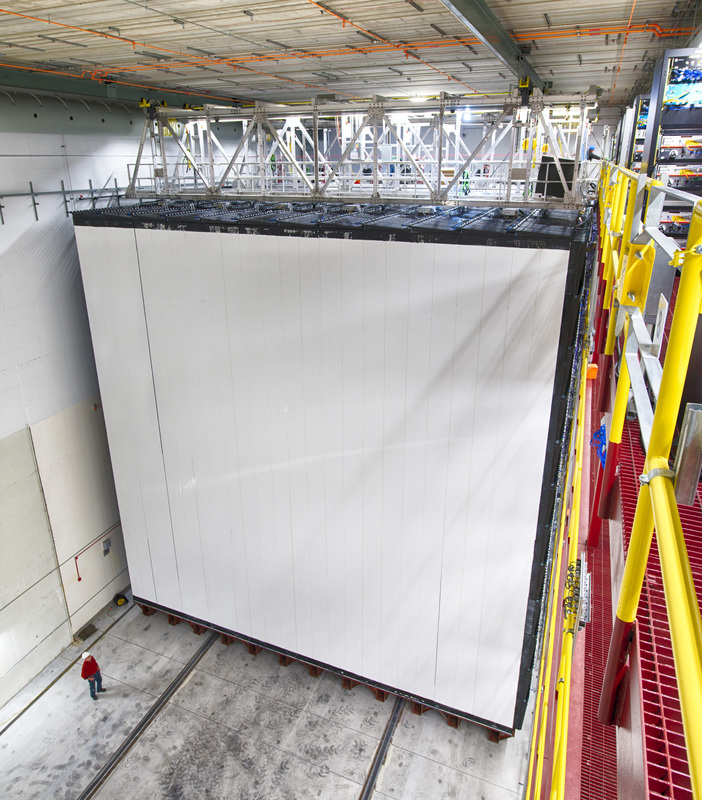 More than 7 cameras recorded the two year long process of constructing the world's largest self-supporting plastic structure, the NOvA experiment's far detector.